Kodak EasyShare V610 pocket dual lens digital camera features Kodak Retina Dual Lens Technology on Sshneider-Kreuznach C-Variogon lenses, 10X optical zoom, embedded BLUETOOTH wireless technology, 6.1 megapixels CCD which able to produce prints up to 30 x 40 in. (76 x 102 cm), 2.8 in. (7.1 cm) high resolution color LCD display, MPEG-4 VGA video recording with zoom and image stabilization capability, Kodak Color Science Chip, on-camera picture enhancing features such as Kodak Perfect Touch Technology, on-camera cropping, and blurry picture alert, plus optional Kodak EasyShare Photo Frame Dock 2 and various software. The Age reviews Kodak EasyShare V610 dual lens digital camera and concludes that the dual-lens system works well on the earlier V570 where the zoom range is at the wide end (23 mm), but doesn’t work so well when the aim is to extend the telephoto range. Good thing is that when this model hits its sweet spot the picture quality is superb. Auto white balance, color, focus and image resolution are outstanding. It will render every vein on the petal of a flower. But sadly, this model doesn’t do it much. More often the picture is blurred. However, it’s inferior in term of no image stabilization, noisy LCD and very slow writing time to the SD memory card means a long pause between shots. The camera reverts to Auto every time it is turned on. Preferred setting can be stored in a custom Scene Mode and recalled with a couple of button presses, which is cumbersome. Buy-n-Shoot concludes that this camera has a number of great features which will please many, such as near instantaneous start up, no shutter lag, plenty of resolution, blue tooth technology, MPEG4 video capability, a tough and stylish metal casing, a large LCD screen, panorama picture stitch and of course great image capture. Just one thing to consider if you’re going to buy this camera, get a second battery as you’ll get around 140 shots before you need a recharge. PhotographyBlog concludes with 4.5 stars out of 5 starts that Kodak Easyshare V610 is a tremendously innovative digital camera that brings a lot of new, exciting and effective features to the consumer. Most obvious is the amazing 10x, 38-380mm focal range in such a slim body, making the V610 one of the most versatile cameras available today. Using such a small camera with such a large zoom range opens up lots of photographic opportunities that you just won’t get with similar sized models. Everything from mild wide-angle scenic to distant close-ups is possible, all from a camera that you can fit into a trouser pocket. The large 2.8 inch LCD screen is one of the best that I have ever seen, with a high resolution giving plenty of detail and also being visible even in bright sunlight. Bluetooth allows you to wirelessly send and receive photos with other Bluetooth-enabled devices, such as laptops or mobile phones, and it is very straight-forward to configure and use. The advanced video and panorama modes are similarly well-implemented – the V610 is generally an excellent camera for the beginner and more advanced photographer alike. DigitalCameraInfo (dead link) concludes that Kodak also expects consumers to pay a hefty price in dollars. $449 to be exact. This retail price tag is way too expensive for a camera that doesn’t take absolutely beautiful pictures, lacks optical image stabilization, and only comes fitted with 22 scene modes, an auto mode, and a movie mode. The Kodak EasyShare V610 is a great concept with its 6 megapixels, 10x dual lens system, and Bluetooth compatibility, but it just doesn’t deliver. CNet gives very good editors’ rating of 7.4 out of 10 that Kodak takes its innovative dual-lens camera design to its logical conclusion. The company pairs a typical compact-camera 38mm-to-114mm zoom lens with a second 130mm-to-380mm lens, for an effective 10X optical zoom range; a gap remains between 114mm and 130mm. Unlike most big zoom cameras, the 6-megapixel Kodak EasyShare V610 is small and made mostly for snapshooters, so it doesn’t include manual exposure controls. Unfortunately, it also lacks image stabilization, which would’ve made that long zoom much more useful, and its image quality doesn’t match its snazzy design. ComputerAct!ve (dead link) concludes with rating of 4 out of 5 that with built-in Bluetooth to transfer and share photos wirelessly to compatible devices, the feature-packed V610 offers good value for money, considering what’s on offer. PC Magazine rates Kodak EasyShare V610 a good editor rating of 3 out of 5 and concludes that Kodak EasyShare V610 blurs the boundaries between ultracompacts and superzooms. But it needs to focus a little more on quality and it could focus better at extreme zoom settings, too. V610 is an attractive, wireless ultracompact superzoom that’s includes some very clever features. But it doesn’t quite compete with the Panasonic superzooms such as the Panasonic Lumix DMC-FZ7 on taking quality pictures. 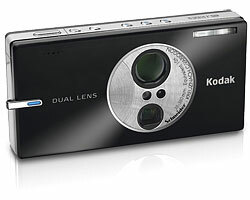 DigitalCameraReview concludes that the Kodak Easyshare V610 is in a very small club – micro-cams with 10X zooms. So the major question facing potential purchasers is this: does the V610 really offer a pocketable alternative to a bulkier long zoom digicam like the Canon S3 IS, the Panasonic FZ50, or the Sony H5? The answer, if Kodak had included IS, would have been a resounding YES. Since Kodak chose not to include IS the answer is a bit more complicated. The V610 is a truly unique camera and it will offer many users a level of convenience, capability, and pocketability that is available almost no where else, but this micro-cams pitifully weak battery and Kodak’s failure to include image stabilization land the V610 solidly in the “could have been” category. RegHardware concludes that the camera’s noise control is good but not good enough at ISO 800, which is a shame because it’s the only option open to you to get faster shutter speeds at those longer focal lengths. Despite this, the Kodak EasyShare V610 is a remarkably compact camera with an impressive zoom range and produces the sort of shots most snappers will be more than delighted with. The addition of Bluetooth is well worth having in these days of share, share, share. Given its target market and its price-point, the “world’s smallest 10X optical zoom digital camera” is just about perfect. LetsGoDigital recommends Kodak V610 with rating of 73% and concludes that Kodak EasyShare V610 is an interesting camera with a nice zoom range. The road Kodak took with the V570 has led to the Kodak V610, but it is a pity that Kodak forgot to improve a few aspects along the way. Especially typical camera characteristics such as ISO and image stabilization should be worked out again on the drawing board. At face value the Kodak EasyShare V610 stands for what it does, but looking at the competition we see that there are more possibilities. DenGuru (dead link) concludes that Kodak EasyShare V 610 delivers on its promise of being the smallest 10X optical camera on the market. Indeed, the 10X zoom worked well. But unless you need the 10X optical zoom in a shirt-pocket size, the list price of $449 is a hefty price to pay for a 6 Megapixel camera. DPInterface (dead link) concludes with overall rating of 6.7 out of 10 that Kodak EasyShare V610 is a compact camera with a 10X zoom range and big LCD. Despite being an “ultra-zoom” camera, the V610 has more in common with compact point-and-shoot cameras. The V610 is different from other cameras in some ways such as having Bluetooth and built-in panorama stitching. Other than that are the standard point-and-shoot features like a heap of scene modes, standard performance, a good movie mode and image quality which is almost on-par with others. Some things to ponder about when considering the V610 include its worst-in-class battery life, no manual controls, a little button clutter and having to live with very limited shooting information. Autofocus could be improved in many ways too. The Kodak V610 just doesn’t cut it to be recommended. The Panasonic Lumix TZ1 is better than the Kodak in many ways and has a single 10X lens which is faster and has optical image stabilization. Photoxels concludes that Kodak EasyShare V610 Dual Lens is overall a fun digital camera that will allow you to take great pictures. Maybe not the best as far as image quality is concerned, but for a take-anywhere [where larger ultra zoom might be frowned upon] point-and-shoot, 10x optical zoom in your pocket is worth its weight in gold. MacWorld has buying advice on V610 that says with a long-range 10X optical zoom, Kodak’s EasyShare V610 can bring the farthest subjects into full, detailed view. Unfortunately, this dual-lens camera also has a propensity for blurred photos at its highest zoom levels, plus disappointingly short battery life. What makes this camera shine—its zoom, Bluetooth capabilities, and large LCD screen—may be enough to compensate for its shortcomings. For more features, specifications, sample photos and firmware updates, visit Kodak EasyShare V610 official homepage (no longer available).